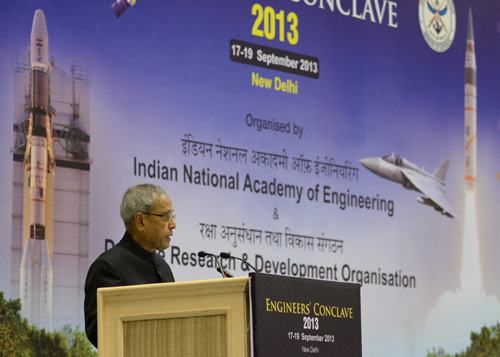 I am happy to be here to inaugurate this Engineers Conclave 2013 being held for the first time in our country. It gives me pleasure to be amongst top Engineers and Technologists from all over the country who have gathered to share their innovative ideas and research and development work in diversified areas of engineering and technology. It is befitting that the present Conclave is being jointly organized by the Indian National Academy Engineering (INAE), the top Engineering Academy of the country and our leading research organization, the Defence Research and Development Organization (DRDO). The two themes of (i) "Manufacturing of Aerospace systems” and (ii) "Transforming Sundarban through engineering interventions” are apt and timely. Engineers play a very important role in every walk of life. They convert knowledge of basic sciences into products. They are versatile minds who build bridges between sciences, technology and society. Engineers contribute to the nation’s technological and industrial progress. They help improve living conditions for the common people. By virtue of our achievements in multiple fields, India stands poised to emerge as a leading nation in the 21st century. The innovation capability of our scientists and engineers will play a critical role in enabling India achieve this goal. This conclave is happening at a time when the world is beginning to emerge from the global economic crisis. Though India’s economic growth has declined in recent times, I am confident we will be able to bring the deceleration to a halt and revert to the high growth levels that we attained in the past. I believe the underlying growth impetus remains strong due to continued rise in per capita incomes, expanding middle-class consumers and a young and energetic workforce. Of course, stronger efforts from all stakeholders can build on this trend, and enable us secure faster growth as the global economy revives. In terms of purchasing power parity, the size of India’s economy is the third largest in the world. The substantial growth rate that our country has achieved over the last few years is second only to China in the world. India’s economy has been more resilient than most of the other emerging economies of the world. A growth rate of 9 per cent per year has been envisaged during the Twelfth Five Year Plan period of 2012 to 2017. Such scales of economic expansion need several enabling factors prominent among them being education. We have, over time, created an infrastructure of good educational institutions for imparting quality education at all levels. In the higher education sector, India is endowed with 659 degree awarding institutions and 33,023 colleges. The number of Indian Institutes of Technology has increased from 7 in 2006-07 to 15 in 2011-12. The number of National Institutes of Technology (NITs) has increased from 20 in 2006-07 to 30 in 2011-12. The enrolment to higher education institutions in the country has similarly increased, from 1.39 crores in 2006-07 to 2.18 crores in 2011-12. Engineering comprised 13 per cent of the total enrolment in 2006-07. This figure has since increased to 25 per cent. The growth rate of enrolment in Engineering, which was close to 25 per cent annually during the Eleventh Plan period, is the highest for any field of individual study. Several steps have been taken to bring about an improvement in the quality of technical education, particularly engineering. Virtual labs developed for science and engineering are being rolled out. The Government, with the support of the World Bank, has been conducting a three-phase programme for technical education quality improvement. While the first phase from 2002 to 2009 covered 127 engineering institutions, the second phase from 2010 to 2014 would cover about 190 more engineering institutions. Engineering Industry is among India’s leading manufacturing sectors. It draws sustenance from India’s formidable base of heavy and capital goods industries, a large knowledge pool, and competitive cost structures. Our thrust on infrastructure development and industrial production provide further fillip to the sector, creating high demand for products across the engineering spectrum from machinery and automotives to power equipment, electronics, and advanced manufacturing. India’s engineering industry has been driven by inter-sectoral linkages and proactive government policies. Special initiatives have been taken to support key sub-sectors, with policies dedicated to automotives, electronics, chemicals and petrochemicals, and heavy machinery, among others. Clusters and growth corridors across the country facilitate competitiveness as centers such as Pune, Chennai and Bengaluru have attained global acclaim for their high quality products. The National Manufacturing Policy, 2011 has envisaged the creation of 100 million additional jobs in the manufacturing sector by 2025. It is expected that share of manufacturing in GDP will increase to 25 per cent by 2022. To make Indian Industry productive and competitive, we must enhance our capabilities on many fronts, primarily human skill, hardware technology, and knowledge base. I strongly believe that there is another milestone to be crossed in the quality and productivity journey. New operating models would need to be considered such as flexible automation, multi-location production, deferred customization and disposable factories. People should be at the heart of the engineering effort, reaching out to human resources, consumers and vendors. The contribution of manufacturing to total employment in India is about 11 per cent, which is lower than that of many emerging countries where the share of manufacturing in total employment is between 15 to 30 per cent. Innovation is a key managerial strategy for growth. We must lay emphasis on its various dimensions such as process innovation, product innovation, business model innovation and new technology innovation. Strong capabilities in designing and building machine tools are particularly critical. Industry must also develop close partnerships with universities and research institutions to take this aspiration forward. A sustainable development model is not only an imperative today but is also opening new opportunities for the industrial sector. Indian Industry should focus on reducing carbon footprint and devising green technologies. Solar energy and other renewable energy markets are expected to grow strongly. Opportunities in green products such as green buildings, bio fuels, and green technologies such as nanotechnology and artificial intelligence should be explored. In our country, a large population lives in villages and there is need for specific technology innovation for rural areas. One innovation that made a difference about three decades back was replacement of wooden wheel by rubber tyres in a bullock carts. It happened almost overnight from south to north and east to west and no one knows who championed it. It was technology simple to implement and helped increasing cart capacity many fold. Our country needs hundreds of such innovations that are simple and sustainable in a rural context. Rather than agriculture tools designed in the west, we need tools that are simple, repairable by local technicians and usable without electricity. If you ask a common man today, what is the role of engineers in your life; he may say a bicycle or mobile phone or an electronic gadget. You ask him further what role Indian engineers have in your life; he may get confused and search of an answer. This is because the achievements of Indian engineers have not adequately percolated down to the grassroots and the potential to impact the common man’s life is yet to be fully exploited. I wish you very fruitful discussions and look forward to the transformation into practical reality of the ideas being germinated here. Arise to the challenges of the day and dedicate yourself to the building of strong India. I have high hopes from India’s community of engineers and I call upon you to lead the way in shaping our country’s future.